Two historic church buildings just a stone’s throw from each other preside over a peaceful prairie setting near Nerstrand, Minnesota. While Valley Grove Lutheran, the congregation that occupied them, had its periods of growth and, finally, decline, today those buildings receive tender, loving care from the Valley Grove Preservation Society. Some prominent names in Minnesota history are a part of the 150-plus total years these church buildings have witnessed. The adjacent cemetery contains graves of family members of former Minnesota Gov. Al Quie (who grew up in nearby Dennison and attended Valley Grove Church). Many of the headstones are in Norwegian. The founding of the historic congregation that built the churches is traced back to Bernt Julius Muus who baptized 52 children at the site in 1859. Muus, who was born in Trøndelag, Norway, also helped found St. Olaf College in 1875. These church buildings are surrounded by 52 acres of prairie and oak savanna; the society restored it to prairie grass in 2001. The society’s oak savanna touches the north edge of Nerstrand Big Woods State Park. 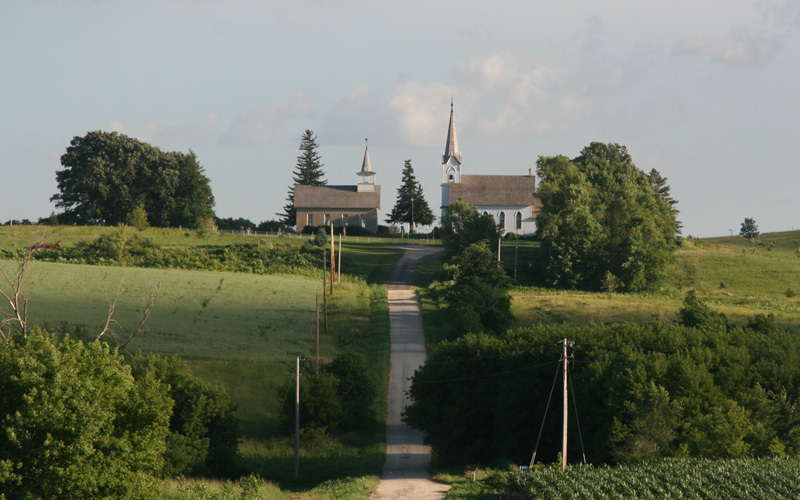 The Norwegian church buildings preserved by the Valley Grove Preservation Society are surrounded by 52 acres of prairie and oak savanna. The structures are listed on the National Register of Historic Places. The older stone building was built in 1862. The other church, a white clapboard building, was constructed just a few steps away in 1894. The newer building has been refurbished and is used for weddings and concerts. Ken Sahlin, treasurer of the Valley Grove Preservation Society, said the organization is just finishing a Historic Structural Report and is planning to apply for a grant to do restoration of the exterior of the stone church building. “It is said to be the only remaining Midwestern example of a total stone exterior that was plastered and had lines carefully drawn to look like regular large stones,” Sahlin explained. “Later we plan to add period lighting and reconstruct the wooden arch that expands the balcony.” He added that the clapboard church needs work on its windows and a new furnace; there are always repairs, and the organ installed in 1911 needs tuning. However, the society is debt-free. The Valley Grove Preservation Society will hold its annual country social on Sunday, September 15, as a way of bringing together people who have ties to the two church buildings under its care or are just interested. The hours of the event are 1 to 4 p.m. The Huutenany musical group that regularly plays in Northfield will perform under the 350-year-old oak tree on the grounds. At 2:30 p.m., Andrea Een, violinist and associate professor of music at St. Olaf College, will play her Hardanger fiddle; she is a founding member of the Hardanger Fiddle Association of America. Additionally, there will be wagon rides into the prairie, drawn by a team of draft horses. Prairie experts will guide walks, and the Rice County Bluebird Advocates will display birdhouses and answer questions about bluebirds. Refreshments will include cake, coffee, and root beer. Kids can milk a goat, see chickens up close, and make hemp rope the old-fashioned way. Admission is free for all of this, but the society does accept donations for restoration work on the church buildings. Directions from Northfield are as follows: Take Minnesota Highway 246 south; turn right just past the six-mile marker on 246. Follow the road to Rice County Road 30; then turn right. Valley Grove is one-and-a-half miles on the left. The group’s website, www.valleygrovemn.com, includes a map of the area. The address is 9999 155th Street East. The mailing address is P.O. Box 75, Nerstrand, MN 55053. For additional information, Ken Sahlin’s phone number is 507/649-1227.